Finding appropriate and fun valentines for boys can some times be a bit of a challenge. With a whole house full of boys, I’ve become an expert as sneaking in a few hearts for the occasion while still retaining all that boyish fun. And with a touch of creativity, there are so many cute themes that can be used. So we’ve already made some transportation valentine goody bags, but we also made adorable airplane-themed valentines this year as well. Our oldest son picked out gliders that he requested be his valentine class treat. Which is great because we can totally skip the whole peanut-free candy headache. So, to coordinate with the gliders, we used the printable airplane valentine from the transportation collection. Printed them all on heavy white card stock from our home color printer, punched two holes at the top of each are and tied them to the already bagged gliders that came that way. So simple! And coordinated… and my favorite… a fun little candy-free valentine treat that still retains all that boyish fun (and maybe, just maybe contains a heart or two). Find even more valentine designs (for boys and girls) on Oodles-and-Doodles.com or at the OandD Etsy shop. Valentine’s Day always sneaks up on me every year. I don’t know what it is… I feel like we’re just getting over the holidays and then it’s magically February. So, in response, I typically pick a really easy Valentine’s Day project. Because, let’s be honest… it’s usually me that does most of the work since all the little hands in this house are mostly interested in eating the chocolate candy and playing with the toys. This year, we went with the super simple Valentine’s Day goody bags for school. I love this idea because we can skip the candy completely and fill the baggies with little valentine-themed toys. We stuck with a transportation theme and used the personalized & printable valentine cards from the shop. I love these because you can use them year after year and the theme works for so many different ideas. And boys can be tricky on this holiday… far too many pink and red hearts out there to make my kids happy. We printed both sets of Transportation valentines on heavy white card stock, stuck them in clear baggies and sealed all the little goodies shut with the matching favor tags. (This is one of my favorite tricks… so super simple and easy … and perfectly coordinated). The trick here is to print the tags on sticky paper. I like Avery Full Sheet labels. The entire page is a giant sticker so you can cut out square tags or punch out 2 inch or 2.5 inch circles. Easy peasy. And done. And….I never had to worry about searching for peanut free school-approved candy. I wish all things were this simple! And you can find lots of other Valentine-themed designs in the Etsy shop and on Oodles-and-Doodles.com. There’s adorable owl designs for girls, animals for the itty bitties, and robots and monsters too! (One day, when I plan ahead enough, I’m going to pick up some eyeball bouncy balls at Halloween and save them for those Monster valentines. How perfect would that be)?! Next year – that’s on my list for next year. It’ll be here before you know it. Starting right around Thanksgiving, the design requests for custom Christmas & Holiday cards start to pour in. Now, I don’t typically have the time to indulge on custom designs during the year, but the holidays become my one exception. I love designing Christmas cards… seeing all those bright smiling faces, and watching the children of some of my favorite clients change from year to year. And let’s face it… those happy, merry little faces just make my day! It completely gets me in the Christmas spirit. So as you can imagine, I get all kinds of requests! And after years of designing custom holiday cards, I’ve come to learn a little bit about what goes into creating the perfect one. So here are a few of my trade secrets. Tip 1: Let the photo do the talking! Don’t try to accomplish too much in one card. Don’t squeeze in an entire year of vacation & holiday & seasonal photos. Don’t include ten barely visible thumbnail photos. Pick one photo from the year that you LOVE. Maybe it’s a fabulous professional photo you had taken or maybe it’s one you took yourself. But pick the one you LOVE and use it. Build everything around it. Keep it simple. And let us all see those big smiling family faces when we receive the card in the mail. Wait… what? ?… one photo… with EVERYONE in it? SMILING? Yeah, I hear you… it’s impossible to get three kids to sit down and smile in one picture. Totally understand. It is (most days). Don’t fight it. Just take a different route. Consider one that includes all of them playing or laughing (and not necessarily posed and smiling perfectly). Or consider breaking up the kids into individual photos but all in a similar design, so it feels like one big photo. Converting the photos to all the same type of finish/color helps create a cohesive feel. Because it’s hard to pick just one. Add a few more photos on the back. A boring, plain white backside to any card is a major pet peeve of mine. After all, you took the time to send all these cards out to family & friends.. use all the space you have! And brighten it all up with a bold matching pattern. For goodness sake, don’t print out cards with your family’s photos that you LOVE at a lousy printer. A great card printed at a crummy printer is… well…. a crummy card. A great image is only as good as the printing, so pick well! It’ll be worth it. And if you’d like to have a custom holiday card designed around your photo, find it all at Oodles and Doodles. With lots more holiday card designs to peruse as well. Everything is available either as a printable file for you to print yourself or printed at a fabulous professional printer in the highest of quality. And shipped next day to you … because, you know, who has time to spend worrying about cards? There’s so much more to do for the holidays! I am super, super excited to announce that I’ve partnered with a fabulous speciality canvas printer and am now offering a Canvas Print option for all my Modern Family Tree Art. This all came about a few months ago as I was looking for some great artwork for my newly renovated bathroom. I searched for such a long time and couldn’t find anything that fit the space. And then one day it suddenly occurred to me… it was a perfect place for a canvas print version of my own family tree. After giving them as gifts for years, I had yet to make one for myself. So, long story short, I teamed up with this truly fabulous canvas printer and they produced the most beautiful printed version of my art. Once I saw it in person, I knew that I just had to start offering it in the OandD Etsy Shop (and coming soon to the Oodles and Doodles website). The prints arrive super fast (which I love. I have no patience.) and are printed on a thick, luxurious poly-cotton blend canvas that is archival grade and lasts over 100 years. Once printed, the canvas is sprayed with ultra-protective laminate coat to make it waterproof, scratch, and UV light resistant. And then finished with a premium satin coating which provides a soft luster finish. These Family Tree prints really are my go-to gift for all those impossible gift-giving occasions (like those 80th birthdays, or 70th wedding anniversaries, or Mother’s Day). And, they’re available in any color to match any decor/event. Now that Valentine’s Day is officially over, we’re moving right on to Spring (and Easter) over here. It’s so nice to think of warm weather and sweet, pastel colors full of bunnies and easter eggs! Oh, how I love spring time… and oh, how I’ve had it with Chicago winters. For literally years now, I’ve been meaning to sit down and create some sweet spring designs. So, I finally got to work designing an adorable pink and purple bunny girl’s birthday party kit. (With two boys in our house, I relish the thought of being able to design in pink and purple… and accent letters with little bows). So check out the someBUNNY Invitation and all the sweet digital goods in the HOPPY Birthday Kit – available both on the website and in the Etsy Shop. And stay posted on some more sweet spring designs hopping into the shop sometime soon! We’re finally getting over the holidays around here and moving right on to the next one…. Valentine’s Day! I love Valentine’s Day. There’s just so many cute things to make for the little ones. We’re already working on some little preschool gifts over here and will be sure to post some photos of our creations shortly. In the meantime, check-out all the new Valentine Designs in the Etsy shop or at Oodles and Doodles. ** AND look for a 10% off coupon on the Facebook Page for all Valentine designs on the Oodles and Doodles website. Our last minute baking and craft project was just completed at our house today. And in the spirit of holiday giving, we’re sharing all the details and a free printable with you! These super easy homemade dog treats are a quick gift for all the lucky dogs in family (and neighborhood). We just whipped up a couple batches, and they turned out perfect. 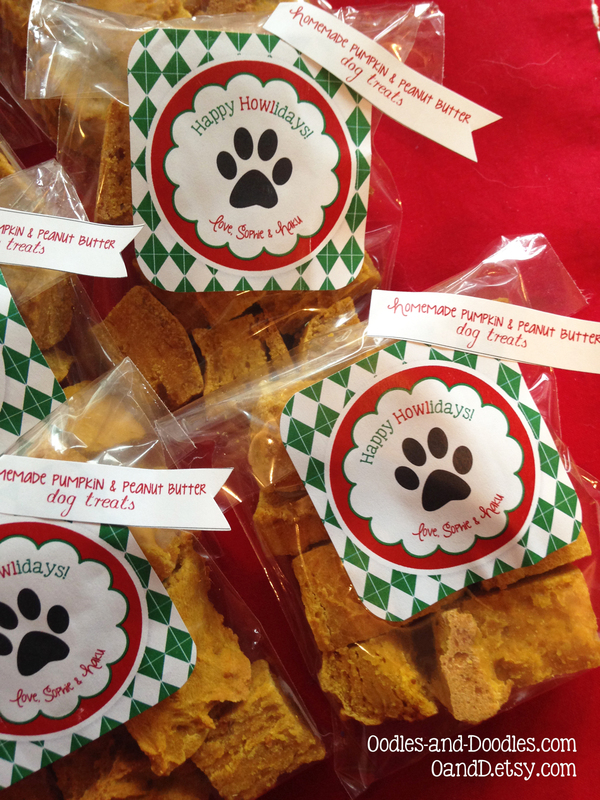 We used a super simple Peanut Butter & Pumpkin recipe, that our dogs loved! They even waited patiently (for once) at the oven for the biscuits to finish baking. Then we just wrapped them up in little clear treat bags and used my free printable HOWLiday labels to seal and decorate. Happy HOWLidays from our dogs to yours! Hope Santa Paws is good to you this year. (And don’t forget to check out our other free dog printables for next year)! Ho! Ho! Holiday Cards (Yep, it’s almost that time again)! I just ordered my Christmas cards today (yeah, I’m one of those people that’s super early or it never gets done). And it got me thinking. Years ago, before I created my own designs, I used to search all the usual vendors for the perfect card. It took forever …. looking through thousands of designs trying to find one that contained the correct colors to match the photo I wanted to use…. and had the right wording (Happy Holidays? Merry Christmas? Happy New Year?) … and the perfect orientation… and a cute back (gotta have a cute back design! )… and the correct number of photos. Honestly, it never really worked out. I always had high hopes, but the colors rarely matched to my photos, and the photos were often cropped weird, and the wording was never exactly what I wanted. My husband used to wonder why I spent so much time and energy on it. I couldn’t help it… it just bugged me. And…well.. honestly… holiday cards are kinda expensive. And are mailed to all those people you haven’t seen in a year. Shouldn’t they be pretty great? So that got me thinking… wouldn’t it be great to be able to offer designs that were based around the specific photos and not the other way around? After all, that’s what I do for my family’s cards every year. Why not for everyone else? And so now I’m happy to be able to offer custom designed holiday photo cards to save you all that hassle. Who needs extra hassles during the holidays anyway? And if you still prefer the templates, there’s oodles of new holiday designs available in the shop too! Happy Holidays or Merry Christmas or Happy New Year (which ever wording you prefer)! Who doesn’t love Halloween? It’s one of my favorite holidays of the year! I always plan way to early and end up with tons of fabulously frightful ideas. This year … it’s all about purple, lime green and orange hues in our house. Sprinkle in some bold chevron, bright diagonal stripes and great polka dots and you’re set for a stylish, festive Halloween Party! This was the design basis for a brand new Boo! Halloween Party Kit available in the OandD etsy shop. It includes loads of digital goodies including a candy buffet Sweet Treats sign, personalized favor tags, Boo bunting, coordinating thank you notes and lots more. And if you’re looking for some coordinating party supplies and craft ideas, look no farther. You can find fabulous inspiration in the photo above. While you’re at it, check out more Halloween ideas on my Pinterest Board and lots of other Halloween printables and photo cards in the Halloween section of the OandD shop.